Saturday, I attended the Transgender Lives Conference at the UConn Health Center in Farmington. Doors opened at 8 AM and the conference got underway at 9 AM. I live only 20 minutes away from the conference, but I was up at 5 AM because I have to feed the menagerie, clean the litter boxes, clean and refill the menagerie’s bowls for their next feeding, get the newspaper from the tube at the end of the driveway and make myself a cup of coffee before I begin to femulate, which got underway at 5:45 AM. I shaved my face, Veeted my legs, showered, slipped on my undies, did my makeup and hair, got dressed and was ready to go at 7:15 AM. 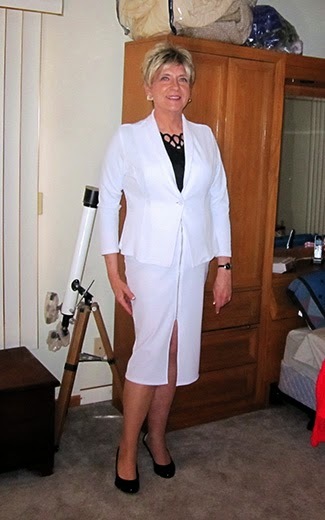 I wore my new “presidential” outfit from Fashion to Figure; a white zippered pencil skirt, matching white blazer, black top with a flower petal neckline, black patent high heels, beige hosiery, silver earrings, black watch and black bag. The weather forecast was good, but I brought my blue trench coat along just in case. Out the door at 7:45, I arrived at the Health Center at 8 AM and found the shuttle parking lot where attendees were instructed to park due to construction at the Health Center. There were no other cars or a shuttle in the parking lot, so I decided to drive right up to the Health Center to see if parking was available there. I saw a UConn police officer working with a group of guys setting up traffic cones in the middle of the parking lot. Almost simultaneously, he spotted me, detected a damsel in distress and walked over to my car to speak with me. I told him I was attending the “trans conference” and wondered where to park. He was as friendly as could be, did not seem put-out helping me and treated me like a lady. It was an affirming moment for me and a great way to start the day! I have met both Monica and Robyn. Monica is a real hoot and Robyn is a true lady. If one wishes to meet Monica and get some of her wisdom, she usually comes to First Event. 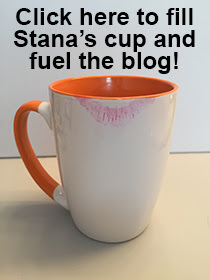 Stana, First I loved your suit and second I was wondering what you thought about Bruce Jenner's interview. Thank you for the compliment, Stacey. Regarding the Jenner interview, I plan to address that topic on Friday. You ROCK that outfit Stana! And what a nice guy that officer was - cheers to him!